Pit Bulls have been appearing in popular culture and the big screen for hundreds of years. 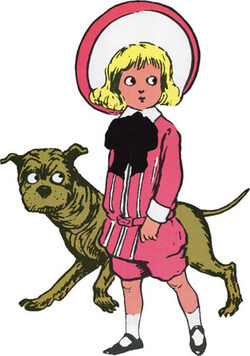 Tige - Tige was one of the most famous fictional pit bulls at the turn of the century. As featured in Richard Felton Outcault’s comic strip and later in famous advertisements for the Brown Shoe Company, Tige showed a time when pit bulls weren’t regarded as tough guard dogs, but as caretaker “nanny dogs”. Tige is also notable as being the first talking pet in comic strips. We knew pit bulls were smart! Petey - Pete the Pup, the son of Pal the Wonder Dog, took over the role of Petey, the canine mascot of the Our Gang/Little Rascals shorts after his father, Pal the Wonder Dog was poisoned in 1930. He appeared in many of the best-remembered shorts, though he was replaced with a series of younger dogs beginning in 1932. He lived to the ripe old age of 16. The trademark ring around his eye was makeup to match his dad’s natural marking. Pitbull - Armando Pérez, better known by his stage name Pitbull, is an American rapper, songwriter, and record producer. His first recorded performance was from the Lil Jon album Kings of Crunk in 2002. In 2004, he released his debut album titled M.I.A.M.I.